A programme of driving restrictions could be brought in on the A256 as part of the Department for Transport and Kent County Council’s ‘post-Brexit’ plans to deal with predicted traffic backlogs at the Port of Dover due to extended border checks. A Traffic Management Plan created to ensure Kent’s highways continue to be open.looks at the impact of queuing traffic arising from the border changes following the UK’s exit from the European Union on March 29. Part of the plan includes a Traffic Assessment Project on the A256, similar to that on the A20 going into Dover where traffic lights are used to control the number of lorries being released into the town and a 40mph speed limit is put in place. 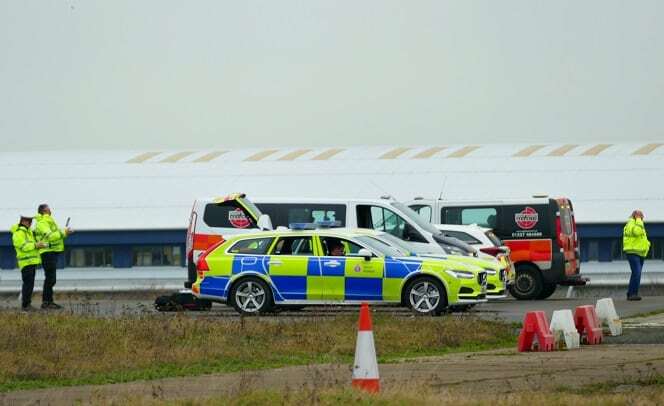 A report to county council Cabinet members also reveals £4.9million will be spent increasing the capacity at the Manston airport site to hold 6,000 – rather than the initial projection of 4,000 – lorries. It will also pay for lining and signing. Kent Fire Service are currently undertaking a fire risk assessment of the truck spacing. 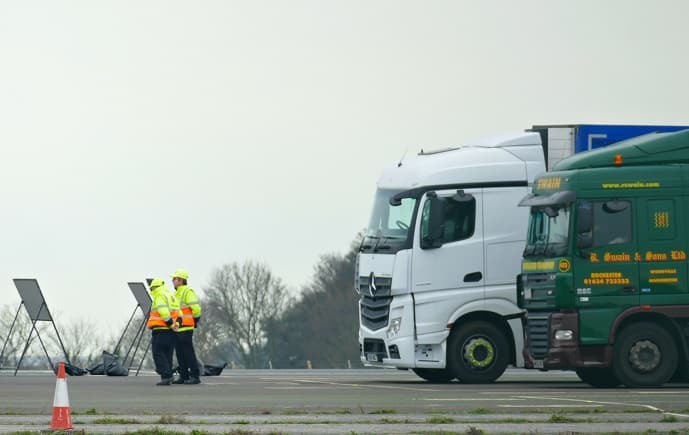 The work is part of plans for Operation Brock – the updated version of lorry queuing system Operation Stack- which contains 5 phases for dealing with a backlog of HGVs. Phase 1 uses the A20 and Dover and Eurotunnel buffer zones, phase 2 is a contraflow system on the M20, phase 3 uses the A256 and sends up to 6,000 lorries to be parked up on the Manston airport site. The cash comes out of a £28.81million grant from the Department for Transport. Other work will include strengthening and resurfacing of key stretches of road on the A249, A256 and A299 with 300 gully strengthening orders in progress; seven lagoons on the Thanet Way or through Dover have been surveyed with work orders for enhanced maintenance in progress and pumps on the Thanet Way have been identified for servicing/ replacement and a full CCTV survey of the Thanet Way, which is prone to flooding, is underway. Road signs will also need to be put in place. The work must be completed by March 29 and KCC has applied for more government funding for ‘post-Brexit’ preparations. 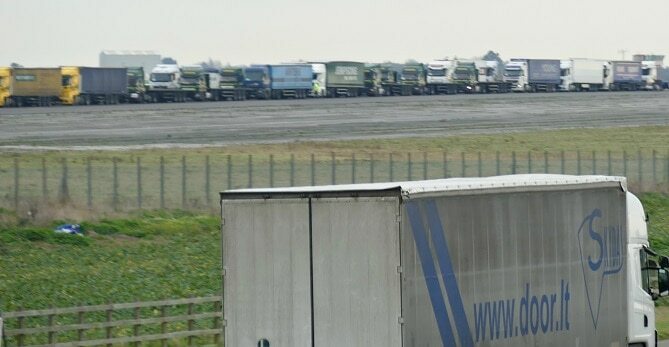 In January last year The Isle of Thanet News exclusively revealed the emergency lorry park designation had cost the Department for Transport more than £5.7 million since 2015. The majority of the money was for site preparations. It has never been used for emergency lorry parking. What a waste of public money ! Or they could just open the damn place as an airport! so KCC have money to do that but wont do anything to it as an airport. More tax payers money down the drain for this load of rubbish holding lorries for only a certain amount of time. In actual fact, KCC supported the then Manston Airport to the tune on more than £500,000 in promoting a route between Manston and Norfolk, Virginia in the USA. Literally, it never took off. Not one plane ever flew on that route. Just why should KCC throw “more tax payers money down the drain for this load of rubbish ” .. I assume you’re talking about the airport? Manston is not viable as an airport, that is simply an unavoidable fact. As for investment, lets remember that scheme that lost KCC £500k was headed up by none other than someone heavily involved with RSP, how interesting. What is the government going to do when the contract is up for renewsal at the end of 2019 and the decision by the Secretary of State for Transport has approved the RiverOak DCO and declared it an airport? Then what? Or, Stone Hill Park residents have good access to Parkway station, A256 Dover / France, A299 – M2, A28 Canterbury. Paid for by Brexit preparations. Possibly Ramsgate even gets the harbour dredged under the same budget. It’s been extended to 2020, Manston will continue to generate a profit at least till then for the 1st time in it’s commercial life. I feel sorry for drivers who have to use the A256 to get to work and back. Looking at some of the figures collated about the Brexit vote, a huge proportion of “Leave ” voters were OAPs who no longer have to get up and out to work in the morning. So they won’t be affected by the hold-ups so much. They have time to find ways round or to alter any appointments they might have. I notice that TV news reporters are forever visiting the market-places of small English towns to interview passers-by about Brexit and , not surprisingly, they always find OAPs out strolling round the stalls who, of course, declare their total commitment to Brexit and all its wonderful consequences. But most working people are never out-and-about mid morning in the town centres. They are AT WORK! If they asked people who have to get to work in the morning and have to survive on UK wages, they might find a lot more “Remain” voters who are in despair about the traffic disruption and the loss of jobs that this whole Brexit adventure will cause. By the way, I am an OAP myself, but I chose to join the 21st century and voted “Remain”. The England I recall in “the good-old days ” before EU membership, wasn’t full of quaint cottages with roses round the door. It was full of cold , damp houses with no heating beyond a single coal fire, dead-end jobs, and less than 5% of children getting beyond 15 years of education before entering work. It wasn’t like an episode of Miss Marple without the murders! God help us if we ever go back to those days in the name of “taking back control”. So you would rather live under a dictatorship . I would certainly not at any price. Perhaps you have not read what is going to hamper in the year 2020, we will then be members of a one country EUROP. Then perhaps you will have Blair as the KING OF ALL 28 COUNTRIES WITH NO SAY AS TO WHAT WE CAN DO AT ALL. I’d rather be in some sort of arrangement with Europe than be in thrall to the USA, China or worse! I agree with Keefogs. Much better to stay in the EU and get our MEPs to press for improvement in the mutual relationship between Britain and the other EU countries. I am in my sixties, and considering the beneficial effects which EU regulations have had on work conditions and environmental matters, I don’t see any good reason to leave the EU. Think of it as a co-operative (good)- not a dictatorship (bad). Not all us OAPs voted to leave, we all get tarred with the same brush it seems. Some of us have a bit of sense. This OAP voted to stay. He could see no benefit, and plenty of disadvantage to leaving the EU. He’s not alone in his opinion: the Treasury, the Bank of England and the CBI think the same. But what do they know? Pitence we now get I Think not?